Advantech Wireless satellite transmission solution for Ultra HD. Montreal, Canada, April 2016: Advantech Wireless will present details of its unique Ultra HD ready Satellite Solution for broadcast applications at a meeting of the Sociedade Brasileira de Engenharia de Televisão (SET) at NABSHOW Conference that will take place April 18 – 20, 2016 at Las Vegas Convention Center. Anderson Markiewicz, Vice President Sales Latin America at Advantech Wireless will discuss the latest developments of using Gallium Nitride (GaN) technology SSPAs for Ultra HD TV transmission and Advantech Wireless’ A-SAT-IITM solution that dynamically adapts to multiple applications to minimize and automate network operation, optimizing the use of the satellite resources, and providing best user experience. 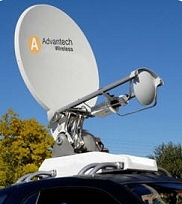 Designed to guarantee reliable transmission over satellite even in harsh and hostile conditions, Advantech Wireless solutions for Broadcast Applications enable mobile TV contribution in High and Ultra High Definition. Visit Advantech Wireless Booth SU2808 on the exhibit floor and outdoor booth no. OE907.